So if you have been tuning in, you probably know all about what went down on Go Skateboarding Day 2009, but If not, I'll summarize for you. At midnight on June 20th, Kona Skatepark held a pro/am contest known as the Fantasy Cup, complete with fireworks at midnight to ring in Go Skate Day. The next day, Kona opened up the park for free skateboarding all day, in addition to playing host to the last leg of Bangers for Bucks, a contest put together by a group of fine individuals who from what I hear are pretty cool guys. The Bangers contest went down on the 4 Block, a massive 4 stair with two big hubba ledges on each side. Chaos descended onto the street course at 6 o'clock, motivating all kinds of people to huck themselves down the stairs in an effort to win a prize. Some of the falls were pretty nasty. A few individuals definitely peaced themselves out pretty quickly, and a notable few came in, got business done, and shut it down-most notably Joey Corey. 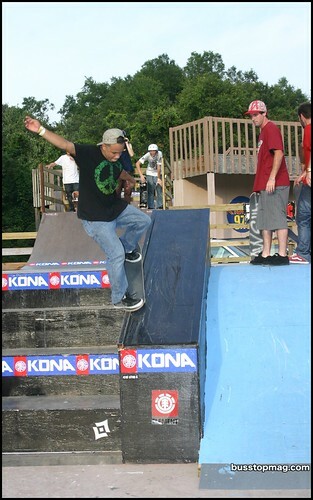 Here are the photos from the final leg of our skateboarding adventure on Go Skate Day 2009. I want to thank Ryan K. for making all of this possible, along with Martin Ramos for an amazing contest at Kona on both days and the free food and drinks for everyone, not to mention the ability to stay resilient with skateboarding all these years. Also want to say thanks to Ian Ranne for the music and the venue for the BusStop party, Clyde for lending his personality, and my kids for letting me postpone our Father's day bonding. Oh, and no thanks to the sun. I look like a damned lobster. Will Watkins at the DJ table. 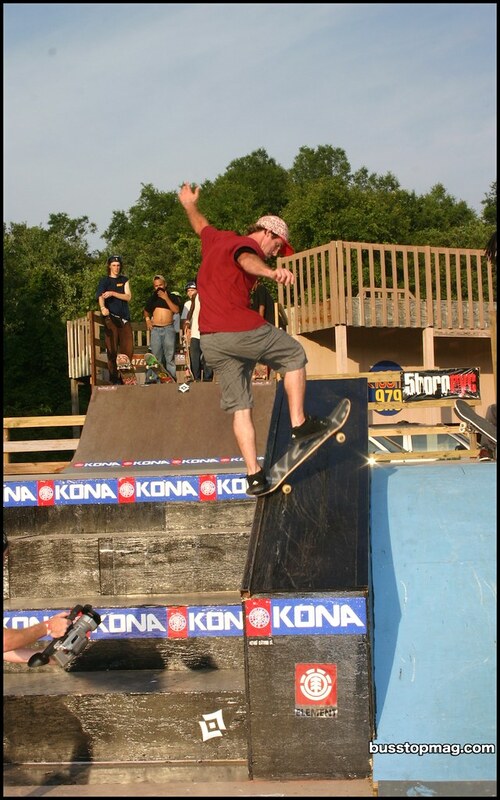 Back in the 90s, will was one of the 2 people I knew that would actually skate the vert ramp at Kona. He was good at it, too. Come back to skateboarding, Will! Is that a naked lady behind you?! I think Pat is about to accept some kind of Bribe here. Zach Torres. This kid is a ripper, too. I hope that kid in front of me got some good footy, he kept jumping in front of me at the last second. I have lots of photos of his back. Broc was running the barbecue. Good stuff.